measured the times of flight. captured signals of alpha decays. with an odd number of protons. but it’s gone in a flash. and there’s not enough to test. Moscovium was obtained from the crashed UFO at Roswell. Moscovium releases gravitons to levitate UFOs. Moscovium powers weapons and creates zombies. Moscovium cures cancer and makes you and me invisible. 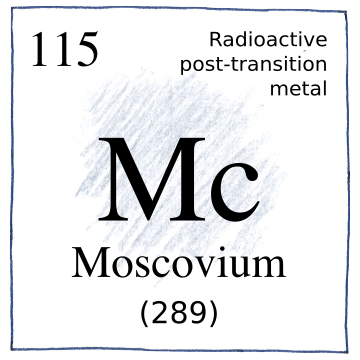 Lead and bismuth impurities in the target obscure an understandng of the chemistry of moscovium, given that for its lifetime it exists in a cloud of debris.